© 2001-2009 SQUARE ENIX CO., LTD. All Rights Reserved. Title Design by Yoshitaka Amano. FINAL FANTASY, TETRA MASTER and VANA'DIEL are registered trademarks of Square Enix Co., Ltd. SQUARE ENIX, PLAYONLINE and the PlayOnline logo are trademarks of Square Enix Co., Ltd. I met a fellow fisherman at Qufim the other day while fishing off the north-eastern cliffs. He turned out to be a really helpful guy which was very lucky for me that day. I un-luck would have it, I actually got knocked-out there on that cliff side. I'm sure purely by accident, I was invited to to a party and mistakenly I joined it. 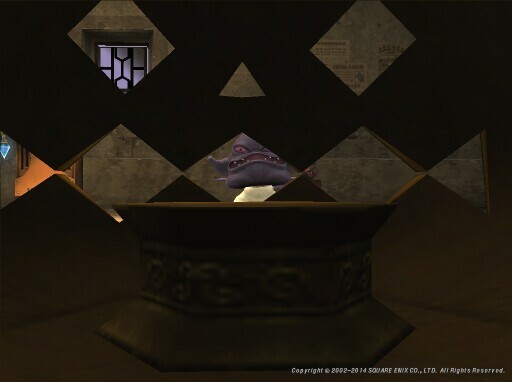 As forces work these days in Vana'diel, my fighting skill (and my power and defenses) were reduced to the level of those already in the party! This was very unfortunate for me as their levels were significantly lower than mine. I disbanded as soon as I had joined but the limiting force didn't lift so quickly. One of the Goblin Bounty Hunters took this opportunity to attack and it laid me out in a single blow! Not only did it hurt, it also hurt my pride. Being the kind adventurer he is, Napolian made his way home via the outpost and returned to me to cast a raise spell upon my nearly lifeless body. Had he not been there, and had he not been as noble as he was, I might still be lying there today! © 2001 - 2007 SQUARE ENIX CO., LTD.